I asked Cory if he wanted to draw a wizard and a dragon. He said yes. I'm the one on the left; the one that looks like Ooogie Boogie's albino lovechild. I'll spare you the "SOPA is bad" speech. I'm assuming that since you're reading this, you're well aware of what SOPA/PIPA are, and what they could do if implemented. It doesn't take a genius to figure out that satire and parody don't play nice with draconian copyright legislation. 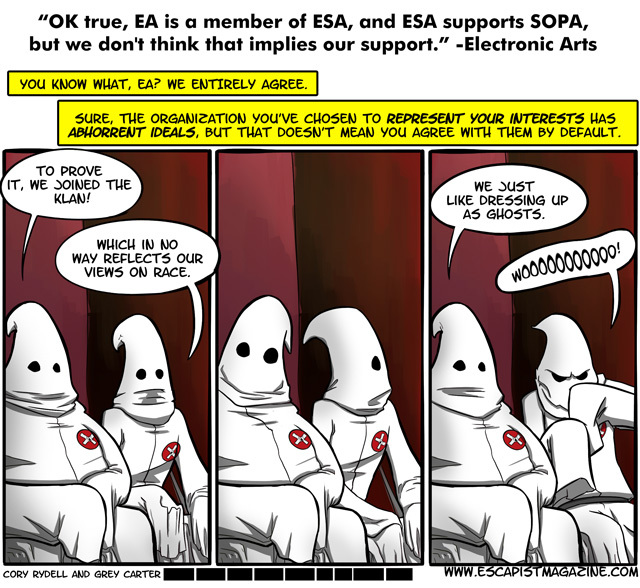 I could sit and bash my keyboard all night long over EA's recent comments regarding SOPA, but instead I'll just let you read this. Needless to say, I disagree. I'd also like to add that I'm very disappointed in the other developers who didn't come out against the bill. Now, unless Lamar S. Smith is caught literally eating a hobo, that's the last you'll hear from us on the subject of SOPA. You can follow Cory and Grey on Twitter, and see various things too awful/morally repugnant for the Escapist on their Tumblr.